Ernest Tubb, known as the “Texas Troubadour,” is among the most influential artists in the history of country music. One of the first country singers to prominently feature an electric guitar in his live performances and recordings, he led to way to both the honky-tonk sounds of the 1950s and 1960s and the outlaw revolution of the 1970s. His deep, gravely, sometimes slightly off-key singing voice remains one of the most distinctive and recognizable voices in any genre of music. The Nashville record shop and broadcast studio that he founded and that still bears his name is itself a historic country music institution on lower Broadway alongside the many downtown honky tonks. 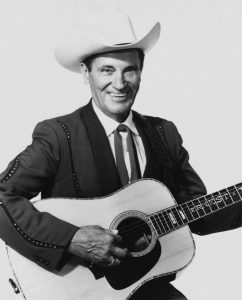 Ernest Dale Tubb was born in February 9, 1914, on a cotton farm near the town of Crisp, Texas. His father was a sharecropper and farm overseer, and Ernest and his four siblings picked cotton and did other farm chores as children. His mother was an amateur singer and piano and organ player who often performed in church. Young Ernest was a big fan of cowboy movies, with such stars as Tom Mix and Buck Jones. But the thing that really grabbed his interest was the singing and guitar playing of Jimmie Rodgers, the “father of country music.” Ernest listened to Rodgers’ records as often as he could and tried to imitate his singing, yodeling, and guitar stylings. In 1933, the 19-year-old Tubb got a job as a singer on a radio program in San Antonio. The young man also worked at various other jobs, including a clerk in a drug store, a beer-truck driver, and a ditch digger for the federal government’s Works Progress Administration. After phoning Carrie Rodgers, the widow of Jimmie Rodgers, to ask for an autographed photo of his idol in 1936, Tubb became friends with her. She helped him get a recording contract with RCA Victor, which had been Rodgers’ label, and guided him on a tour of regional theaters to promote his first records. However, Tubb’s initial recording efforts were too similar in sound to Rodgers and failed to generate much notice. A medical problem ended up giving Tubb a new direction in his budding music career. After undergoing a tonsillectomy in 1939, Tubb found that his voice was now lower than it had been—and that he could no longer yodel like Rodgers. This development forced Tubb to search for a new singing style, as well as to write songs for himself to match his new style. Ernest Tubb and the Texas Troubadours performing on stage. This early success allowed Tubb to work full-time as a singer—on a radio program at KGKO in Fort Worth and as the traveling “Gold Chain Troubadour” promoting Gold Chain Flour (made by the sponsor of his radio program). He performed at Texas grocery and feed stores and at other regional shows. In 1941, Tubb scored a huge hit with what would become the signature song of his career—the self-penned “Walking the Floor Over You.” This song is considered the first big honky-tonk hit. His career soon spread outside Texas as he toured through other southern states in package shows with other country performers, such as Roy Acuff and Bob Wills. In 1943, Tubb joined the Grand Ole Opry, which gave him regular exposure to country music fans across much of the nation. He was the first Opry performer to feature an electric lead guitarist, which generated some controversy. Tubb singing “Walking the Floor Over You” on television in 1961, twenty years after having his first hit with the song. Tubb produced a series of hit records during the 1940s, including “You Nearly Lose Your Mind,” “Soldier’s Last Letter,” “Tomorrow Never Comes,” “It’s Been So Long Darling,” “Rainbow at Midnight,” “Filipino Baby,” “Drivin’ Nails in My Coffin,” “Let’s Say Goodbye Like We Said Hello,” “Slippin’ Around,” and “I’m Biting My Fingernails and Thinking of You” (the latter with the Andrews Sisters). Tubb composed many of his hit songs himself. Tubb singing “Slippin’ Around,” which he scored a big hit with in 1949. Many of these songs featured electric lead guitar solos that typically followed the song’s basic melody. No other country artist of the era featured an electric guitar so prominently in both recordings and live shows. 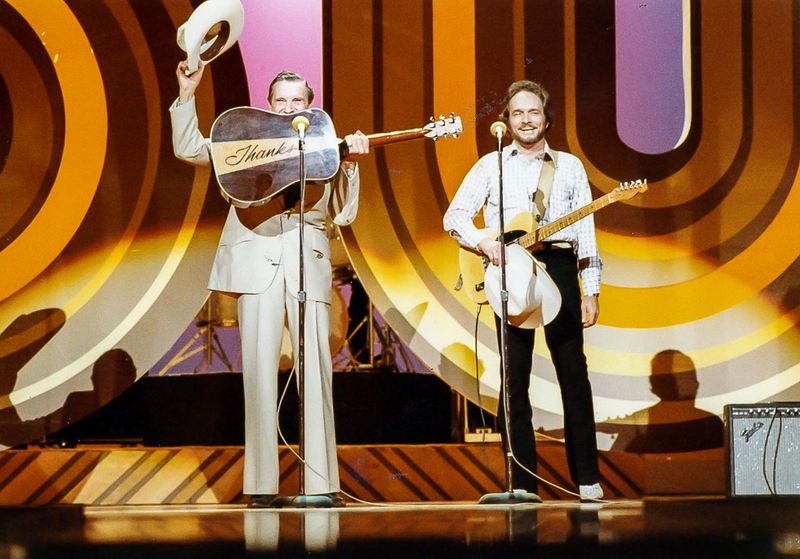 Tubb explained his use of electric guitar in his band by noting that it could be heard better in the loud environment of the honky-tonks where he and his “Texas Troubadours” played. The key role of Tubb’s electric guitarist was played throughout his career by, sequentially, Fay “Smitty” Smith, Jimmy Short, Tommy “Butterball” Paige, Billy Byrd, and Leon Rhodes. On his recordings, Tubb typically called out the guitarist’s name at the start of the solo (“Aww, Billy Byrd now…”). Video clips of Billy Byrd performing with Tubb. Tubb opened his famous “Ernest Tubb Record Shop” on lower Broadway in Nashville in 1947. 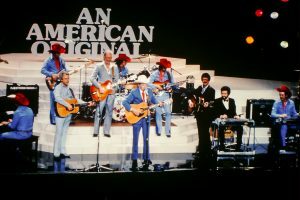 Not only did the shop sell records, but it also broadcast a live show called the “Midnight Jamboree” on WSM immediately after the Opry broadcast on Saturday nights. Both the shop and the show have continued to the present day. In another milestone of 1947, Tubb presented the first Grand Ole Opry show at Carnegie Hall in New York City. Tubb also acted in a number of Western movies in the 1940s. 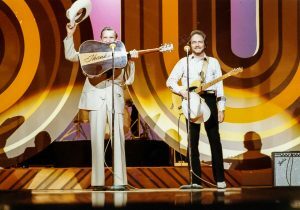 Ernest Tubb and Merle Haggard perform together during the taping of a national TV show. Tubb’s hits lessened in frequency during the 1950s and 1960s as Hank Williams, Hank Snow, Patsy Cline, Skeeter Davis, George Hamilton IV, Jack Greene, Cal Smith, Johnny Cash, and other artists whom Tubb had helped get started (such as by giving them exposure on the Midnight Jamboree or using them as musicians in his band) became the new stars of country music. He also recorded many duets during this period with singers ranging from Red Foley to the Wilburn Brothers to Loretta Lynn. From 1965 to 1968, he hosted a music television show, which featured a young Willie Nelson in early episodes. In fact, Willie Nelson was actually a member of Tubbs band in 1962 and as such, was given a sterling silver belt buckle by Ernest Tubb inscribed with his name. (The buckle can be seen today on display at the Willie Nelson and Friends museum). And he toured extensively. From the early 60s to 1982, Tubb and his Troubadours performed about 150 to 200 shows per year. Loretta Lynn singing with Tubb on “Who’s Gonna Take Your Garbage Out,” which the duo originally recorded in 1969. Tubb was inducted into the Country Music Hall of fame in 1965. He was only the sixth member up to that point. He was inducted into the Nashville Songwriter’s International Hall of Fame in 1970. “Waltz Across Texas,” featuring Willie Nelson singing with Tubb and Charlie Daniels playing guitar, from the 1979 album The Legend and The Legacy. Following a long battle with emphysema, Tubb died at Baptist Hospital in Nashville on September 6, 1984, at age 70. During his lengthy career, Tubb had a total of 91 songs on the country charts. But his enormous legacy lies not only in his music, but also in the way he changed the music industry. He was one of the first singers to record in Nashville, helping establish it as “Music City USA.” And it was through his urging that music publications stopped referring to “hillbilly music” and began referring to “country music” instead. “Ernest Tubb: The Texas Troubadour,” by Ronnie Pugh. Duke University Press, 1998.